Whether you are the petitioner or the respondent in a divorce, navigating the complex landscape of Arizona divorce law can be difficult without the skilled guidance of an experienced divorce lawyer. At the Dorris Law Group in Tucson, we specialize in many areas of family law, including divorce, child custody, and property division. We understand that, even under the best of circumstances, divorce can be one of the most stressful and difficult events you endure in your lifetime. 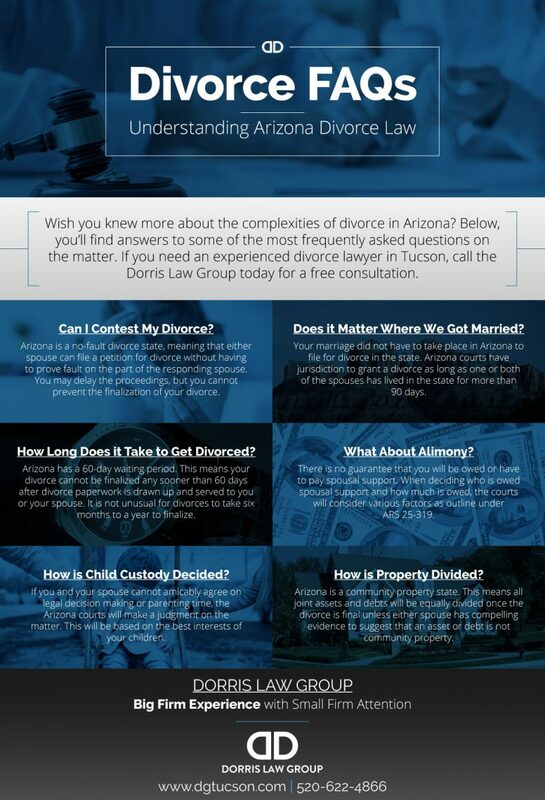 Below, we have provided high-level answers to some of the most frequently asked questions about Arizona divorce law. Please note that the information contained in this post is for informational purposes only and should not be construed as legal advice of any kind. If you have questions about the divorce process or if you would like to request a free consultation, call us at 520-622-4866 now. What if I Don’t Want a Divorce? Arizona is a no-fault divorce state, meaning that the spouse filing for divorce does not have to prove that the other spouse has done anything wrong, only that the marriage is irreconcilable. If you feel your differences can be resolved, you can request that the courts order a conciliation period in which you and your spouse work to resolve your differences. However, if your spouse still wants a divorce after this, the divorce will be granted. What if We Were Married in a Different State? Regardless of which state you exchanged marriage vows in, Arizona courts have jurisdiction to grant a divorce as long as one or both of the spouses have lived in the state for more than 90 days. The answer to this question largely depends on your unique circumstances, and many divorces take anywhere from six months to a year to be finalized. Because Arizona has a 60-day waiting period, your divorce cannot be finalized any sooner than 60 days after divorce paperwork is drawn up and served to you or your spouse. While there is no black and white method to determining alimony, Arizona Regulatory Statute (ARS) 25-319 provides some guidance. When deciding who is owed spousal support and how much is owed, the courts will consider various factors including the duration of the marriage, the established standard of living, and the contribution and earning potential of each spouse. How is Child Custody Decided? As of January 2013, Arizona courts use the term “legal decision making” rather than “child custody.” The courts will always default to what is in the best interests of the child, and if you and your spouse cannot amicably agree on legal decision making or parenting time, the court will decide. Arizona operates as a “community property” state with regard to your marital estate. This means that each spouse owns 50 percent of any joint assets and debts accrued during the marriage. Unless either spouse has compelling evidence to suggest that an asset or debt is not community property, it will be divided equally when the divorce is final. Need an Experienced Tucson Divorce Lawyer? Are you a Tucson-area resident who needs an experienced and compassionate divorce lawyer? If so, look no further than John Dorris with the Dorris Law Group. We are a full-service law firm in Tucson, and we can provide you with the attention and representation you need to obtain the best possible outcome for your divorce case. Contact us today to request your free consultation.